Police: Shooting Suspect Was 22-Year-Old In Threatening Videos : The Two-Way Seven people were killed and 13 others injured in what authorities call a "premeditated mass shooting" near a University of California, Santa Barbara, student community. 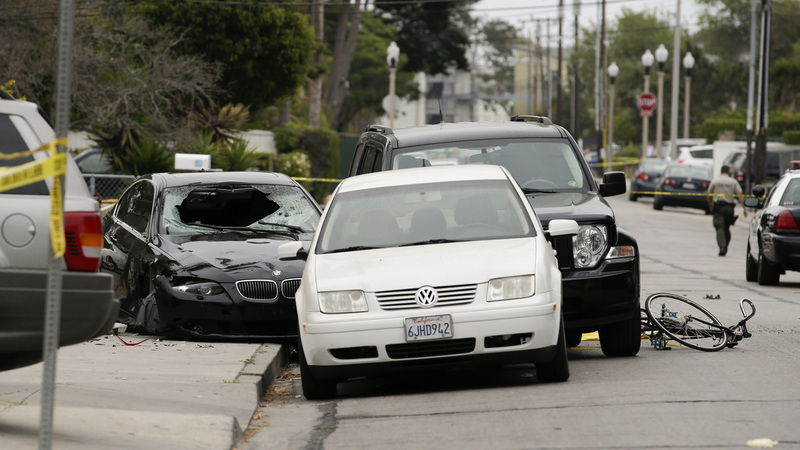 Police tape marks of the scene where a black BMW sedan (left) driven by a drive-by shooter, rests on Saturday The shooter went on a rampage near a Santa Barbara university campus that left seven people dead, including the attacker, and others wounded. Police have identified 22-year-old Elliot Rodger as the suspect who opened fire Friday night in a busy commercial strip just outside the University of California, Santa Barbara, campus. During a Saturday news conference, Santa Barbara County Sheriff Bill Brown said the rampage left seven dead — including the suspect — and 13 others injured in the hospital. Some were injured by gunfire, some were hit by a vehicle. Three of those killed were apparently stabbed repeatedly at the apartment of where Rodger lived. Their identities have not been released. Of those killed from gunshot wounds, two were women shot outside of a sorority house, the other was identified by his father as 20-year-old Christopher Martinez. Martinez was allegedly shot by the suspect in a deli. Brown acknowledged both the videos posted on the Internet by the suspect, as well as a sprawling 141-page biographical "manifesto" that was sent to the media. The document details Rodger's life up until the point where he planned his "Day of Retribution." Brown also said the department had had three documented contacts with Rodger prior to Friday's incident. The suspect is believed to have started shooting at 9:27 p.m. PT in the small community of Isla Vista, Brown said. By 9:33 he had been engaged by deputies and shortly thereafter he was found dead in his car "from an apparent gunshot wound to the head." Brown said police found three semi-automatic handguns in the car along with more than 40 loaded magazines of ammunition. Working with the ATF, Brown said all of the weapons and ammunition were obtained legally and were registered to Rodger. Brown said it appeared that Rodger took his own life and that they believe the suspect acted alone. This is a breaking news story. We'll update as more details become available. In a brief press conference seen on CNN, Ricardo Martinez said his son, 20-year-old Christopher Martinez, was killed in the shooting. "When will this insanity stop? ... Too many have died. We should say to ourselves 'not one more,' " he said. In a letter to the UC Santa Barbara community, the school's chancellor, Henry T. Yang, said the university was "horrified and deeply saddened by the tragic events in Isla Vista last night." Young says the school has set up a campus call center and is working with police and local authorities to provide information as it becomes available. He also thanks the campus police "who acted quickly and courageously to protect our students and other Isla Vista residents and prevent an even greater tragedy from unfolding." In a statement, UC Santa Barbara says that some of those injured during last night's shooting were students. "While details on the shooting are scarce and families are still being notified, the campus is already taking steps in response. University officials have set up a room for families who are coming to campus, and are making counseling services available to any students, faculty and staff who need our support. UC Santa Barbara officials are also working with the local County Sheriff's Office and have opened the campus' Emergency Operations Center. We will share additional information as it becomes available." "One local resident and UCSB student, Niklas Svennefiord, said he saw the suspect flee from police, from his house at 6585 Del Playa Drive. The suspect, a man in a white shirt, crashed into a nearby black jeep, he said. "'I heard a couple gunfire shots. I thought they were fireworks, so I didn't think about it, but I was pretty startled and then I heard a car hit into another car. So I look up into my little window that's in my shower, and I see a guy try to flee and the cops shoot him,' Svennefiord said. "Svennefiord said the suspect then continued to flee from police and also said that he believes one of his best friends was killed. "'I see a guy try to flee out of the car and the cop shoots him and then runs up to the car, seriously, and runs up to the car, looks into the car and the guy tries rolling around, and the cop kind of kicked him to make sure he was down,' Svennefiord said." And just to repeat, authorities have said they don't know if the gunman was killed by police or if he committed suicide. Police said they are investigating nine different crime scenes. Authorities say drive-by shootings in the Santa Barbara, Calif., area have left three dead and seven others wounded in what authorities said was a chaotic scene Friday night, The Associated Press reported. Two suspects were detained after the shootings in Isla Vista, near a student community next to UC Santa Barbara. Police cordoned off four crime scenes and warned residents to stay inside and visitors to stay away, according to KEYT NewsChannel 3. Student Michael Vitak spoke to a KEYT reporter.
" 'Guys in a BMW. Maybe they were trying to prove they're tough,' Vitak said during a live televised interview. Vitak saw them shooting at two girls; one was shot dead, the other was critically hurt.
" 'I heard shots, screams, pain,' said Vitak. 'All emotions. I hope she is going to be fine,' he said." Isla Vista is known for parties, including one last month that turned into a violent blowout, according to the AP.